Questions abound about humic acid, and the science is constantly changing. Here’s a list of answers to the top ten questions that we most often hear. Click on a question below to find out more, or simply scroll through for all the answers. 1. What is humic acid? 2. What’s the difference between humic acid and humate? 3. How do humic acid and fulvic acid differ? 4. Do I need to use both humic and fulvic acids? 5. Where do humic acids come from? 6. Why does my soil need humic acid? 7. Are all humic acids the same? 8. Is humic acid a type of fertilizer? Or a type of biostimulant? 9. Is compost a type of humic acid? 10. Is there a reliable way to test the quality of humic acid products? Simply put, humic acids are fully decomposed remains of organic life. They're long-chain molecules that are high in weight and dark brown in color. They are not a single acid, and a specific classification has eluded scientists to date. Rather, "humic acid" is a broad term that refers to a complex mixture of many different acids that are soluble in alkaline solutions. They exist naturally as part of nature's life cycle in soils, oceans, and streams. Due to modern farming methods, humic acids are less abundant in today’s agricultural and gardening soils, because the natural cycle of life, death, decay, and rebirth has been disrupted. Thus, it is imperative for these acids to be replaced to restore a healthy soil, healthy plants, and healthy crops. Benefits of humic acids include better soil structure, improved water retention in soil, increased cell wall permeability, increased crop production, decreased disease and infestation, and a decreased need for fertilizer and associated costs. For more information on humic acid, please visit our comprehensive article here. The terms “humic acid” and “humate” are often used interchangeably, and so it can be confusing to differentiate between the two. In simplest terms, humate refers to the black solid matter that contains humic acid. Using fruit as a broad analogy, “humate” would be the orange, and “humic acid” would be the Vitamin C.
A sample of raw humate from the Menefee Formation in New Mexico, USA. Humates form from rich, ancient wetland environments. Over time, these massive beds of decaying material were covered by heavy formations, where they compress under intense pressure. Thousands or millions of years later, these deposits fully decomposed into humate deposits, which are rich in humic acids, and thus vital to today’s healthy soils. How do humic acid and fulvic acid differ? From a functional standpoint, the biggest differences between humic and fulvic acids are a) their size and b) their function. And the two are related. Humic acids are big carbon-based molecules that are wonderful in soil environments for providing improved structure, better water retention, and “pathways” for nutrient exchange between the soil and plant roots. They’ve also been shown to improve cell wall permeability in both the leaves and root zones of plants. Fulvic acids, on the other hand, are smaller molecules that function best as the “carriers'“ of nutrients into the plant from the surrounding environment, whether through the soil or through a foliar application. For more information on the difference between humic and fulvic acid, please visit our comprehensive article here. Do I need to use both humic and fulvic acids? Opinions on this question differ, depending on whom you ask (and what they’re selling). But the shortest answer is “most likely, yes.” While humic and fulvic acids serve slightly different functions, there is significant interdependence between the two. For instance, humic acids have been proven to increase cell wall permeability, which enhances the ability of fulvic acids to carry nutrients into a plant. Similarly, humic acids unlock nutrients that are trapped in soil, which increase the availability of those nutrients. As the science improves, researchers are growing increasingly holistic about their view of these beneficial acids. And so it’s becoming more and more unwise to claim that one of the two is the “magic bullet,” and that you wouldn’t need to include the other in your fertility program. Specific needs may vary. If you’re implementing a hydroponic growing system, where no soil is involved, then you may decide to emphasize fulvic acids. If your soil is highly degraded, or you’re experiencing significant compaction, then you’ll certainly want to emphasize humic acids. But overall, your best bet is to stick with what works in nature, and deploy humic products that include both humic and fulvic acids. How do humic acids form? Humic acids form in nature whenever organic matter—from deceased plants and animals—begin to decompose, due to insects, bacteria, and fungal activity. This process is referred to as '“humification,” whereby the changing molecules are becoming more and more stable, and less prone to further decomposition. The resulting material is call humus, and comprises three parts—humin, humic acids, and fulvic acids. In healthy soil, humus comprises about 2% of its total composition. And in a healthy natural environment, this process is ongoing and ever-developing, a by-product of nature’s cycle. In a healthy soil environment, organic matter is ingested and disposed of by a variety of life forms, resulting in a material called humus, which includes humic acid. Once the living creature dies, its molecules are available in the soil for use by other organisms. Carbon is one of the most sought after elements, because it is a food source that provides energy. Bacteria, fungi, protozoa, and other soil inhabitants consume the fresh material, in either aerobic or anaerobic processes, dependent on the environment. Earthworms and insects further break down the material. The “fresh” dead matter is referred to as “active fraction organic matter,” because it is the primary food source for microorganisms. The decaying process begins with the breakdown of carbohydrates. Other simple carbon molecules are also easy for organism to digest, such as sugars, starches, and amino acids. This energy gained is often then released as carbon dioxide. Other matter, such as lignin, waxes, and resins, break down more slowly. This continuing process is often referred to as “humification,” because the matter that is breaking down is moving toward becoming humus. After long periods of time, when the decaying matter has been eaten, transformed, and defecated, what remains is called humus. Humus is a general term that refers to highly complex, stable compounds that are resistant to further decomposition. When decaying matter reaches this state of humus, it is referred to as recalcitrant organic matter, due to its resistance to further decomposition. However, humus is absolutely vital to soil, and stimulates microbes and plants while they consume other nutrients in the ecosystem. The process described above has been hampered by modern agriculture, which is not set up as a natural system, or what’s now called “sustainable agriculture.” And so humic acids are not forming in healthy levels on much of today’s farmland. Thus, humic acid has to be replaced. And that’s why it’s necessary to turn to those few areas on the Earth where humic acids have collected into rich reserves. This material, known as “humate,” formed from ancient wetland environments that were buried beneath heavy layers of rock and sedimentation. Over thousands or millions of years, a similar process of decomposition happened as described above. But because these areas were protected from erosion, and compacted by heavy caps, they contain humic acid at a much higher concentration than today’s compost. And so what’s left is an invaluable, non-replicable, source of rich humic acids that can redistributed at a high enough level to benefit depleted soils and plants. For more information on how humic acids form, please visit our comprehensive article here. Why does my soil need humic acid? Soil with inadequate levels of humic acid. Soils also require humic acids for their abundant carbon content. Healthy soils maintain a sufficient level of Soil Organic Carbon (SOC). (This organic carbon differs from elemental carbon, which is indigestible to soil organisms—also known as inorganic carbon). Soils with a low SOC don’t provide the necessary food source for soil microorganisms, and the soil environment suffers. Humic acid products provide a beneficial carbon food source for soil microorganisms, which are vital to a healthy soil and productive plants. In deficient soil environments, fertilizers alone won’t fix the problem. This is because even if you’re adding nutrients to the soil, they may not make it into the plant. For any cations/nutrients that are outside the root zone, and sometimes even for those nearby, they make lack the necessary mobility to fertilize the plant. This is referred to as a low “cation exchange capacity.” This effect is why many farmers get frustrated when their fertilizers don’t seem to be working optimally. Much of the beneficial nutrients they’re adding are either sticking the soil or are leaching away. For a grower, this is equivalent to pouring money down the drain. However, when humic acid is reintroduced, the soil structure improves, nutrient mobility (“cation exchange capacity”) escalates, and plants become restored to their natural, healthy state. This in turn increases fertilizer efficiency, crop yields improve, and profits increase. Are all humic acids the same? No, and in fact, no two humic acids are the same. They’re complex, ever-changing acids, and humic acids from different sources act differently. Over the years and decades, humates sourced from specific regions of the world have shown to perform better than humates from other areas. (Humates sourced from northwest New Mexico, where Earthgreen sources its material, have proven for decades be the world’s premium source of humic acids.) There are also other important considerations, such as the age of the source, whether or not the source is freshwater or saltwater (freshwater is preferable, so as not to introduce more salt into the soil), whether the source has been contaminated at any point, whether the material has been sufficiently exposed to oxygen, and how much time, pressure, and heat was applied to the formation. Too much of those components can lead to the formation of anthracite coal, a hard, shiny substance which is used for energy but is not beneficial as a soil amendment. So be sure to do your research, and go with products that have proven effective, time and time again. Is humic acid a type of fertilizer? Or a type of biostimulant? Humic acids generally aren’t considered a fertilizer. Whereas fertilizers provide specific nutrients to plants, humic (and fulvic) acids increase the availability and uptake of those nutrients, and improve the overall growing environment. Thus, humic acids are often termed a “soil amendment,” and they work wonderfully in tandem with fertilizers to increase their efficiency. This is why humic acid products are so often blended with other nutrients in a grower’s fertility program to greatly enhance the results. But what about a biostimulant? Yes, humic acids are certainly considered a biostimulant. Biostimulants are a substance that stimulate the biological activity of an environment, thus enhancing nutrient uptake and quality. Humic acids are among the most powerful and useful biostimulants in nature. Is compost a type of humic acid? No, compost isn’t a type of humic acid. Compost does contain humic acid, but not in a sufficient enough quantity to restore the humus levels of a depleted soil. Compost is decomposing organic matter that provides a food source to soil organisms, which in turn excrete material that plants can use as nutrients. Humic acids, on the other hand, are fully decomposed materials that are stable and resistant to further decomposition. Relying on compost to restore humus levels in soil would require an immense and impractical application rate. Compared to compost, humate contains a far richer supply of humic acids, higher carbon levels, and higher humic acid levels. Compost is composed of fresh, decaying organic matter. 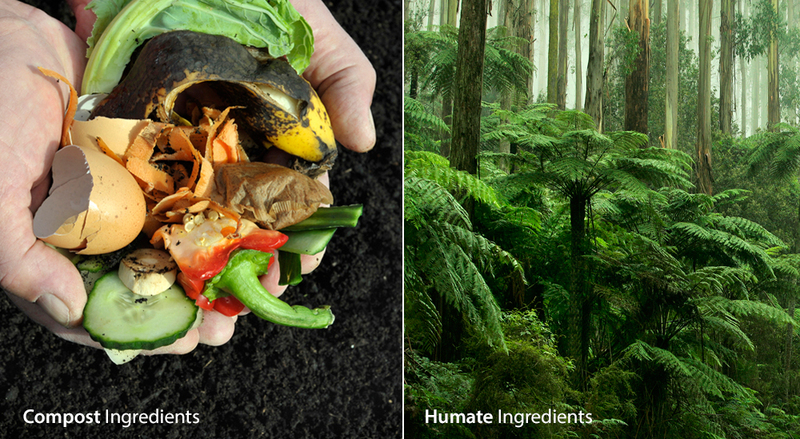 On the other hand, humate sources are composed of the plant remains of entire ancient forests. Humate is far richer in humus, humic acids, and carbon, and the age of humate allows its material to fully decay into a stable state. Is there a reliable way to test the quality of humic acid products? Testing standards for humic acid are still developing. 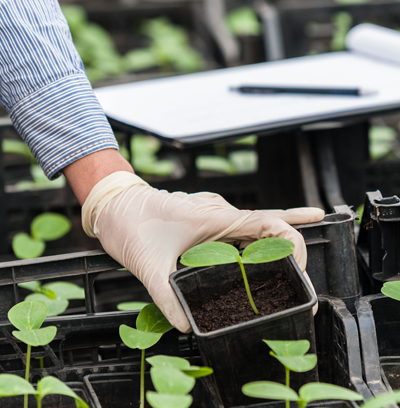 The ISO (International Organization for Standardization) and the HPTA (Humic Products Trade Association) have made great strides toward standardizing procedures for analysis of humic material. However, current laboratory methods still vary greatly, and there still isn’t a precise definition for what constitutes a “humic acid.” Further, it’s difficult to isolate the humic acid percentage from a material and disregard its other characteristics, including its source, purity, carbon content, manufacturing methods, etc.. Scientists are increasingly taking a broad, holistic view of soil science and humus, and are increasingly shying away from the search for a single metric that can rank a product. One thing is certain, though—you definitely want to ensure that humic acid is abundant in your humic acid products! Many products that claim to be “humic” products contain very little or no humic acids, and these will of course yield none of the benefits of humic acids, and such products have sullied the reputation of humates in the past. For the time being, the most reliable method to test the effectiveness of a humic product is field research on a variety of crops and in a variety of conditions. Such research continues to show that humates from New Mexico are the premiere source of humates in the world. And for over twenty-five years, Earthgreen has conducted dozens of independent research studies on our products that prove their effectiveness and consistency.